WE APPRECIATE YOU THE CUSTOMER! THE WAY IT SHOULD BE! ASK FOR JIM! When residents of Glenview, IL and the surrounding areas are in need of junk removal services, they rely on the attentive care offered by A-Affordable Hauling. We always put the needs of our clients first and offer both flexible appointment scheduling options and competitive rates on all of our services. We've received an Angie's Super Service Award for five years running, and we offer personalized and same-day care to all of our clients. We're proud to offer discounts to seniors, veterans, and both police officers and firefighters. Proudly serving Glenview, IL, A-Affordable Hauling is a full-service junk removal company specializing in all aspects of estate clear outs. We are proud to offer competitive pricing, and we're even more proud of the quality of our work. When junk really starts to pile up beyond control in your Glenview, IL home, the idea of clearing it out can seem overwhelming, if not impossible. But before you resign yourself to spending every free weekend cleaning out your basement, attic, or garage, call on our team for help. As an established junk removal company in Glenview, IL, we offer residential clean out services designed to save you time and aggravation. Time to de-clutter? Don’t spend hours hauling load after load to the landfill or recycling facility. At A-Affordable Hauling, junk removal is our business. We help homeowners just like you reclaim their homes, their yards, and their storage areas through prompt, professional junk removal. One call to A-Affordable Hauling, and your unwanted items are off your property and off your to-do list in no time. Cleaning out an office or retail space? Want to get rid of junk or debris once and for all? Put our experience to work for you. The waste removal professionals at A-Affordable Hauling in Glenview, IL offer prompt and reliable commercial clean out services designed to ensure that your project is as efficient, cost-effective and worry-free as possible. Whether you're moving, redecorating, or simply trying to free up some space in your Glenview, IL home or business, A-Affordable Hauling is on hand to help. As an established junk removal company in Glenview, IL, we offer cost-effective furniture removal services designed to make the process simple and hassle-free. A hot tub is a great place to relax and unwind - until you don’t want it anymore. If you’re stuck with a big, bulky hot tub or spa at your home Glenview, IL, A-Affordable Hauling can help. An old, unwanted or broken hot tub can be a huge hassle. Too big and heavy to remove on your own, it quickly becomes an eyesore and consumes valuable space. But A-Affordable Hauling can come to the rescue. Unwanted or broken appliances do more than just take up space. In some cases, they can actually create a hazardous work or home environment. If you're in need of appliance removal services in Glenview, IL, call on us to get the job done. Are piles of junk taking up valuable space in your Glenview, IL home or business? Do you have unwanted furniture, appliances, or equipment sitting around collecting dust? Don't resign yourself to a lifetime of clutter, and don't run the risk of injury by attempting to remove your belongings yourself. At A-Affordable Hauling, we have the tools and manpower to haul away those items you no longer want or need. Our clean out services are designed to help you reclaim your space without having to break a sweat. Whether you're wrapping up a home renovation project or have recently completed a major construction-related task, one thing's for sure: You're bound to have a fair amount of leftover debris on your hands, and removing it can all too quickly become a hassle. So if you need debris removal services in Glenview, IL, turn to our team to get the job done. A-Affordable Hauling wants to help you with all of your storage needs. Whether you're in the process of making a move or simply looking to clear some clutter out of your garage, you can count on us to provide you with a safe and cost-efficient way to store your belongings. Our locally owned and operated company serves residents throughout Glenview, IL and the surrounding areas. A-Affordable Hauling is dedicated to providing affordable and reliable foreclosure cleanout services for houses and business in Glenview, IL. JUNK REMOVAL SERVICES & MORE! A-Affordable Hauling has been providing quality junk removal services to Glenview, IL and the surrounding areas like Northbrook, Wilmette, Winnetka, Evanston, Park Ridge, Highland Park, Deerfield, Arlington Heights and many more since 1993. Our business is both locally owned and operated and family-owned and operated, and we’re fully licensed and insured. We always make customer service a top priority, and we’re proud to have been awarded the Angie’s List Super Service Award five times. 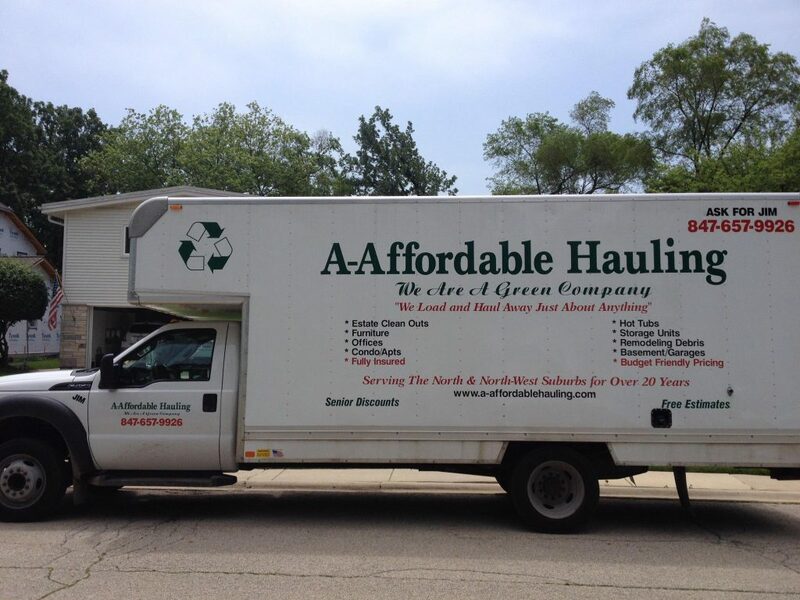 Find a junk removal service you can count on by calling or visiting A-Affordable Hauling in Glenview, IL. A member of our team will be happy to answer any questions you may have. We offer discounts to seniors, veterans, and military personnel. We’re available every day, 8am – 10pm.